Raymond Rougeau’s father is Jacque Rougeau Sr, and brothers are Jacques Jr and Armand – Also Johnny Rougeau (Uncle). Raymond Rougeau started wrestling as a teenager in Montreal in the early 70s. Raymond Rougeau was given a big push because his father was the lead face in the promotion. Raymond Rougeau formed a very successful tag team with his brother, Jacques known as the Rougeau Brothers. 1985: The Rougeau Brothers joined the World Wrestling Federation and wrestled mostly on WWF Canadian Tours. August 26, 1985 – WWF in Montreal: The Rougeau Brothers defeated Jimmy and Ron Garvin. September 23, 1985 – WWF in Montreal: The Rougeau Brothers defeated Iron Mike Sharpe and Rene Goulet. February 1986: The Rougeau Brothers travelled to Australia for a special International Tour with the WWF. February 28, 1986 – WWF in Sydney, Australia: The Rougeaus defeated The Moondogs. March 23, 1986 – WWF in Toronto TV TAPING: The Rougeau Brothers defeated The Moondogs. March 25, 1986 – WWF in Montreal: The Rougeau Brothers defeated The Hart Foundation. June 15, 1986 – WWF in Montreal: The Rougeau Brothers defeated Nikolai Volkoff and Iron Sheik in a Texas Tornado Match. August 6, 1986: The Rougeau Brothers were guests on Vince McMahon’s Tuesday Night Titans show. August 18, 1986 – WWF in Montreal: The Rougeau Brothers defeated Jimmy Jack and Dory Funk Jr.
August 21, 1986 – WWF in Ottawa: The Rougeau Brothers defeated Terry and Dory Funk Jr.
August 28, 1986 – The Big Event: The Rougeau Brothers defeated The Dream Team (Greg Valentine and Brutus Beefcake). October 6, 1986 – WWF: The Rougeau Brothers defeated Steve Regal and Jimmy Jack Funk. October 21, 1986 – WWF in Montreal: The Dream Team and Pat Patterson beat The Rougeaus (Raymond, Jacques Jr., Jacques Sr.). November 1986: Jacques Rougeau went down to an minor injury and Raymond began teaming with substitutes. November 19, 1986: The Rougeaus and Billy Jack Haynes defeated The Dream Team and Dino Bravo. January 27, 1987: The Rougeaus and Hillbilly Jim defeated The Dream Team and Johnny Valiant. March 27, 1987 – Wrestlemania III: Greg Valentine and Brutus Beefcake defeated The Rougeau Brothers. March 2, 1987: The Hart Foundation defeated The Rougeau Brothers to retain the Tag Team titles. April 6, 1987 – TV: The Rougeau Brothers defeated The Hart Foundation (Tag Champs) in a NON TITLE match. April 13, 1987 – TV: The Hart Foundation defeated The Rougeaus to retain with help from Danny Davis. May 1987: The Rougeau Brothers began wrestling Greg Valentine, Dino Bravo and Johnny V at House Shows all over. June 2, 1987 – TV Taping: The Rougeaus and Brutus Beefcake defeated Johnny K-9 and Jimmy Jack Funk and Mike Sharpe. June 5, 1987: The Rougeaus and Brutus Beefcake defeated Greg Valentine and Dino Bravo and Johnny V.
June 23, 1987 – TV Taping: The Rougeaus and Brutus Beefcake defeated Greg Valentine and Dino Bravo and Johnny V.
August 10, 1987 – WWF in Montreal: The Rougeaus defeated The Hart Foundation (Champions) and were declared the champions! ~~~The decision was overturned, and the title reign was never recognised because they used Jimmy Hart’s megaphone. November 26, 1987 – Survivor Series: The Rougeaus participated in the Tag Team (20-Man) Survivor Series Match. September 16, 1987 – TV Taping: The Rougeaus and Jim Duggan defeated The Hart Foundation and Danny Davis by DQ. January 10, 1988 – WWF in Toronto: The Conquistadors defeated Jacques and Raymond Rougeau. January 24, 1988 – WWF in Halifax: The Rougeau Brothers defeated The Conquistadors. February 22, 1988 – WWF in MSG: The Rougeau Brothers defeated Harley Race and Mike Sharpe (sup for Hercules). May 10, 1988 – TV Taping: The Rougeaus and Sam Houston defeated Danny Davis and Chris Curtis and Keith Van Zandt. ~~~After the match, The Rougeau Brothers started to turn heel and will begin a feud with the Killer Bees. The Rougeaus turned heel, becoming “all American boys” – smiling heels with tiny US flags pretending to be pro-American. March 27, 1988 – Wrestlemania IV: The Rougeau Brothers participated in the 20-Man Battle Royal (won by Bad News Brown). 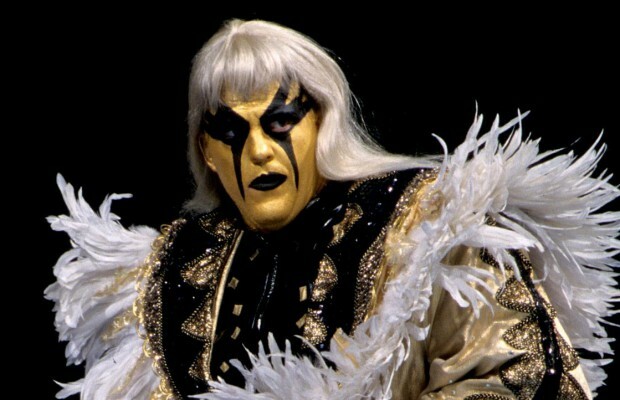 July 1, 1988: Demolition defeated The Fabulous Rougeau Brothers to retain the Tag Team titles. July 25, 1988 – WWF in MSG: The Fabulous Rougeau Brothers defeated The Rockers (Shawn Michaels and Marty Jannetty). July 31, 1988 – WrestleFest: The Fabulous Rougeau Brothers defeated The Killer Bees. August 24, 1988 – TV Tapings: The Fabulous Rougeau Brothers were guests on the Brother Love Show. August 28, 1988 – SummerSlam: The Rougeau Brothers wrestled The British Bulldogs to a TIME LIMIT DRAW. October 5, 1988 – TV Tapings: The Rockers defeated The Rougeaus by DQ when Jimmy Hart tossed the Megaphone in for a weapon! November 24, 1988 – Survivor Series: The Rougeaus participated in the Tag Team (20-Man) Survivor Series Match. November 26, 1988 – SNME: The Rougeau Fabulous Brothers defeated The Young Stallions. 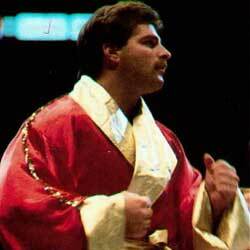 December 1988 – New Brunswick: Raymond Rougeau won an 18-man battle royal to earn a WORLD title shot! ~~~In the Main Event, Randy “Macho Man” Savage defeated Raymond Rougeau to retain the World title. January 6, 1989 – WWF in Montreal: Hulk Hogan and Jim Duggan and Ron Garvin defeated The Rougeaus and Dino Bravo by DQ. January 15, 1989 – Royal Rumble: Jim Duggan and The Hart Foundation defeated Dino Bravo and The Rougeau Brothers. February 3, 1989: The Rougeau Brothers beat the Hart Foundation with Brother Love as the referee! February and March 1989: The Rougeau Brothers began jobbing to the Bushwhackers all accross the country. March 17, 1989: The Bushwhackers and Jim Duggan defeated The Rougeaus and Dino Bravo. March 18, 1989 – WWF in MSG: The Bushwhackers and Jim Duggan defeated The Rougeaus and Dino Bravo. April 2, 1989 – Wrestlemania V: The Bushwhackers (Luke and Butch) defeated The Rougeau Brothers w/Jimmy Hart. April 25, 1989 TV Taping: The Rockers vs The Rougeaus (NO CONTEST) after Michaels was knocked out by the megaphone! June/July 1989: The Fabulous Rougeaus began wrestling the Rockers all over the country, trading victories. June 22, 1989: Demolition and Tito Santana defeated The Rougeau Brothers and Rick Martel. June 1989: The Rockers (Michaels and Jannetty) defeated The Rougeaus in a Best 2/3 Falls match. August 4, 1989 – WWF in Montreal: The Rockers beat The Rougeaus in a 60-Minute Marathon match 3-2 in Overtime! ~~~The Rockers and The Rougeaus had other 60-Minute Marathons on 8/6 (Chicago), 8/19 (Phili), and 9/9 (Boston). October 10, 1989 – WWF in the UK: The Rockers (Shawn Michaels and Marty Jannetty) defeated The Rougeau Brothers. October 14, 1989 – SNME: The Bushwhackers (Luke and Butch) defeated The Fabulous Rougeau Brothers. November 23, 1989 – Survivor Series: The Rougeaus participated on a Survivor Series team with Rick Rude and Mr. Perfect. January 21, 1990 – Royal Rumble: The Bushwhackers defeated The Rougeau Brothers after hitting the battering ram. The Rougeau Brothers left the World Wrestling Federation shortly thereafter. Raymond Rougeau retired in the early 90s and worked for the WWF as a Canadian and French-language announcer.